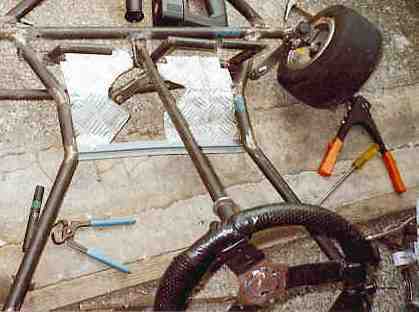 Looking from the pictures of the completed Racing Kart that I have made, the floor pan is non existent. The main reason been that I had no checker plate left to cover the entire floor or even the front floor area of the Racing Kart. The cost of checker plate is just too expensive. Instead I just proceeded in putting the left over checker plate around the pedals as this is where my (the drivers) feet always rest. This at the very least is essential, otherwise one's feet would either be constantly on the pedals or on the road. Below one can see how I placed the checker plate around the pedals in the position of the drivers feet. One can see in the above photo how the foot rests had to be cut out to an unusual shape, this was due to the swinging over and back of the steering drop arm. A small bend was made in the checker plate so that the track rods could move freely underneath. There are many variables and one will not know the answer until one ends up in that position/ problem. I pot riveted the checker plate in position, which was a pretty good and secure method. A word of CAUTION however is not to go drilling holes in the main chassis for rivets etc., as it will only end up concentrating all the stress in that area resulting in weakening of the chassis. From the above photo, a gray cross member can be seen. I had to introduce this piece to secure the foot rests/ checker plate to, and as it is not for chassis rigidity I chose a light off cut of flat metal I had lying around. Another word of Caution is that, for young children or people with short legs etc. a full floor pan is advised for safety reasons. Only imagine if a foot or leg wandered down through the gaping hole in front of the seat when the kart is moving. Anyways that's about it for this Racing Kart Plans section. As I said earlier I hope to have all the drawings done out in AutoCAD properly in the near future. Of course I cannot hope (would like to be able to however) contain all the small tinkering and adjusting involved in making this kart and others like it. The very best of Luck to those going to make this kart. As ever I will do my best to answer your questions etc. via e-mail about this Racing Kart or anything else related to engines, gearboxes, chassis etc.